The Vermont Department of Fish and Wildlife is enlisting Vermonters to help identify remnant bat populations that so far have survived the outbreak of white-nose syndrome in New England. The department has launched “Got Bats?” a program that enables Vermonters to report bats roosting in the attics and rafters of houses. The initiative also is designed to educate homeowners on strategies to exclude bats out without killing them. Scott Darling, a state bat biologist, says residents have been very engaged on the issue of white-nose syndrome, a fungal infection that has killed an estimated 6 million to 7 million bats. The fungus has wiped out some 85 percent to 90 percent of some species of hibernating bats in infected areas. Since the fungus was first discovered in 2007, it has spread quickly throughout the Northeast, thriving in the moist caves of New England, said Dave Yates, mammal program director for the Biodiversity Research Institute. The fungus primarily has attacked six species of bats that hibernate in caves. In Vermont, it has cut down two species, the little brown bat and the northern long-eared bat, by an estimated 90 percent. The Vermont Agency of Natural Resources is listing the two species as state-endangered. The Got Bats? program will ask homeowners to help researchers find surviving bats, especially the state’s two so-called house bat species, the little brown bat and the big brown bat. Now that bat populations have been decimated, it’s vital to keep track of even small handfuls of survivors, said Ann Froschauer, national white-nose syndrome communicator for the U.S. Fish and Wildlife Service. “Even if there are just five or 10 bats in the house, it might be a big deal in terms of genetic diversity,” she said. White-nose syndrome is considered an invasive fungus that scientists believe was accidentally introduced by caving enthusiasts from Europe. North American bats seem to have no defense against the fungus, which goes deeper than most skin infections. “It actually grows down in the living tissue and erodes the living tissue,” Froschauer said. Bat health is all about skin surface. A bat’s thin skin tissue not only helps with flight, but also regulates critical body temperature to help a bat survive in winter. Bats have few, if any, fat reserves, and must slow their metabolism down in a roost with moderate temperatures to ride out the cold months. The fungus disrupts that delicate balance and causes the bats to need to be more active in the winter, perhaps because they have used up their energy reserves. Scientists are only now beginning to understand how white-nose syndrome affects bats. They were caught off-guard by the outbreak, said Froschauer. “It was sort of starting at ground zero,” she said. Some researchers are beginning to study how European bats have developed a natural resistance or positive interaction with the fungus. In the meantime, decontamination protocols have been developed for researchers and cavers who enter infected caves, as humans are believed to be a prime source of the fungus. Casual cave explorers are being asked to avoid white-nose infected areas. “The best thing the public can do is really try to stay out of caves and roosting areas of bats,” Yates said. While biologists can’t quantify exactly what effect the massive loss of bats will have on the ecosystem as a whole, they believe it will be wide-ranging. Bats eat their weight in insects each night, and they are the only bug predators who are nocturnal, said Mollie Matteson, a Vermont conservation advocate for the Center for Biological Diversity. “Bats are kind of like the night shift,” Matteson said. If they are removed from the equation, farmers and foresters will see a steep climb in pest damage, biologists say. This most likely means they will have to resort to more pesticides to control the pests, which could impact waterway health. Bat losses could particularly impact organic farming, which cannot fall back on synthetic pesticides. “Those folks really look to natural pest-control measures, like bats,” Matteson said. Fewer bats also mean more mosquitoes, which could damage the summer tourism industry. 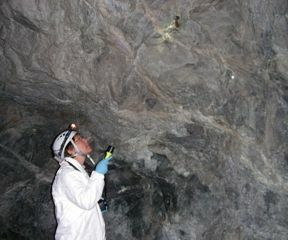 And bat guano is a critical source of nutrients; bats single-handedly keep some cave ecosystems alive. But just because bats are so beneficial doesn’t mean homeowners always are comfortable with hosting them in their roof rafters, and that creates a unique tension, said Darling. “This is the only state-endangered animal that’s actually living in people’s homes,” he said. The Got Bats? program wants to educate homeowners how to exclude bats without hurting bat numbers further. The bats that roost in homes in the summer most likely are maternity colonies of pregnant females, Darling said. Females congregate in packs to give birth and tend to their newborn. That’s why the state is asking that no action be taken to remove bats during the summer birth season, roughly from mid-May until late August. An exception is made for bats suspected of carrying rabies or exposed to rabies; typically only 1 percent of bats carry the rabies virus. Before and after the pupping time period, it’s advised to install one-way entrances in holes that will allow bats to get out, but not come back in. Bats may hang around the eaves of houses for a period of time after they have been evicted, but they will eventually move on, Darling said. He understands that some homeowners might be squeamish about sharing their homes with bats, but bat numbers are so down now that homeowners shouldn’t fear having to contend with large colonies. “Frankly, our bat populations have been hit so hard, we’re not seeing a build-up of guano happening,” Darling said. The Vermont Department of Fish and Wildlife can help homeowners find bat remediation specialists in their area and provide technical advice. For more information, click on http://www.vtfishandwildlife.com/wildlife_bats.cfm or call 802-241-3700. On the website, there also is an online form for reporting bats in your house to researchers.